Students run five mounted cameras in the BYU-I Center auditorium. The Teton Dam Marathon is a multi-distance race, including a full marathon, a half marathon, a 10K, a 5K, and a children’s race. The marathon starts at the Teton Dam Site and ends at Smith Park in Rexburg. Rob Tietjen of Bitesize feels like an investor who's bought in on the ground floor of a good deal. By helping to build a successful startup company in Rexburg, Idaho, he and the others on his team have positioned themselves for a pretty nice reward. The investment is the town of Rexburg; the payoff is being delivered by its workforce. Bitesize, a high-tech startup that uses software to make complex employee training easy and affordable for companies, is just one of a growing number of tech firms that call Rexburg home. Can't-miss talent is their drawing card. "We are hiring software engineers and developers, writers, content creators, account managers, administrative staff, and marketing and sales personnel," says Tietjen, president of Bitesize. "Very good talent from the student body at Brigham Young University-Idaho is located here. They have strong computer information systems and CIT departments. The people of Idaho are hard-working and honest. Quite a few young people learn languages from around the world. That gives us the ability to support customers with training in multiple languages." "If you want to have the optimum opportunity to take advantage of a young population that has a very high work ethic and very high honesty in a low-cost location, then this is the place to be." Tietjen says he plans to grow his business from 22 employees to around 100 over the next two years. The quality of the workforce makes that possible. "If you want to have the optimum opportunity to take advantage of a young population that has a very high work ethic and very high honesty in a low-cost location, then this is the place to be," he says. He is not alone. All over Rexburg — a city of 30,000 residents anchored by the campus of BYU-Idaho — entrepreneurs and established firms alike are setting down roots and investing in a long-term future for both themselves and the community they love. Sixteen years ago, Rexburg had just 17,792 people. By 2010, the city's population had grown to 25,464 — a 69-percent increase in 10 years. Since 2000, enrollment at BYU-Idaho has increased by over 60 percent to around 18,000, and the school plans to grow by an additional 30 percent within the next five to 10 years. "Our number one asset is our young, highly trained, highly motivated workforce," says Scott Johnson, director of economic development for the City of Rexburg. "We have one of the fastest-growing universities in the country, adding 1,000 students a year for the last 10 years. With that many students, we have the sustainable workforce that companies want." Tietjen concurs. "Our retention rate is extremely high," he says. "Our qualified staff hardly ever leave. We found the people of Rexburg to be extremely friendly and service-oriented. They always want to help. We found the community to be very family-oriented and welcoming. Also, the whole Idaho experience of being in the mountains is attractive." Brian Haynie, founder and CEO of life insurance brokerage Topo Financial, says there is a direct correlation between the success of his two-year-old firm and the workforce of Rexburg. "We are employing millennials here," he says. "Topo is a full-service life annuity brokerage specializing in long-term care. If students want to pursue a career in the financial services world, this is a good place to start. We are basically a startup, and we have grown from three employees to about 50 during peak time. There is a high quality of students here who want to work hard. They want to earn their stripes. We hire many of them as interns and we give them that opportunity." Haynie says he likes being in a rapidly growing community. "Per capita, Rexburg must be one of the fastest-growing cities of any rural agricultural community in the US," he says. "They grow wheat, barley, potatoes and entrepreneurs here. The business climate here is steady and consistent. Software companies are choosing to locate here, and more will come." He notes that "it is hard to find a community that is as family-friendly and as family-focused as this. This is a great place to raise kids, and the outdoor amenities here are second to none. We are so close to Sun Valley, Jackson Hole, Yellowstone, fly fishing, camping, hiking, and pretty much anything else you would like to do outdoors. We like the situation we have." With a median age of 20.6, Rexburg ranks as one of the youngest cities in America. Its nickname is America's Family Community, due to its overall friendly atmosphere and youthful population. "We have four seasons. We are the safest city in Idaho, and we were the 11th safest city of any size in the US last year," says Johnson. "One misconception is that when people see our official unemployment rate of 2.7 percent, they think they won't be able to find anyone to hire here. But we did a study that included the BYU-Idaho students and found that our actual unemployment rate was 23 percent. We have a 99.6-percent high school graduation rate and an over 87-percent college graduation rate in our community. Where else in the country are you going to find educational attainment rates that high?" Kyle Rawson, founder and president of Syphon Sound, calls Rexburg "a safe place to own a business." Outdoor recreation drives that business for Rawson. "We make flexible speakers for motorcycle and dirt bike helmets," he says. "This lets the riders listen to music while they ride and do so comfortably." "The business climate here is steady and consistent. Software companies are choosing to locate here, and more will come." Founded in Rexburg, Syphon Sound has seven employees and is growing briskly, he notes. "The rent and cost to operate a business is cheap. Access to a large pool of talent is here due to the large university. I would call it a sophisticated level of talent. We decided to set up shop here because we are heavily involved in the outdoor sports scene. It helps both our company culture and the morale around the office." Clark Gilbert, president of BYU-Idaho, says his university — the largest in total student body size in the state — plays a major role in advancing innovation and entrepreneurship. "We are focused in STEM areas like computer science and technology," he says. "We have 2,500 declared majors in those subjects, plus another 5,000 declared majors in material sciences. Altogether, we have over 8,000 students pursuing STEM degrees. 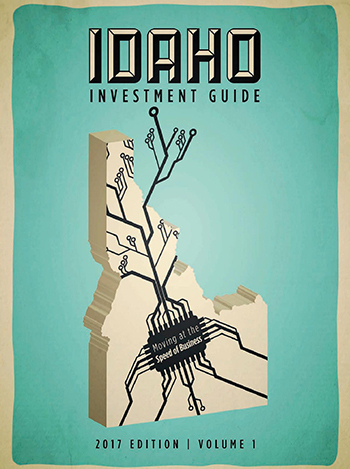 That creates an enormous resource for this community and the entire state of Idaho." Success stories like Topo, Zylun Global and Adoption.com exist in the community largely due to the presence of BYU-Idaho, Gilbert says. "Adoption.com put its headquarters here. The main reason? To have access to our students. High-growth firms want access to them." With 30,000 online students, BYU-Idaho serves a large virtual community, Gilbert notes. "We continue to grow six to seven percent a year. Our Science and Technology Center is being completed now, and we just redid our Agriculture and Life Science Center for our animal and plant science majors. We have grown our STEM programs so rapidly, but we have always remained a student-focused university. We are geared to respond to the needs of our students." Rexburg Mayor Jerry Merrill says that "the biggest advantage we have is the high-quality, educated workforce that we are carefully cultivating, and it is affordable." He cites a good example. "A company with a branch in Atlanta needed to fill 150 positions and they had to interview 12,000 people in Atlanta to fill those jobs," the mayor says. "When they came to Rexburg and spent three days interviewing people here, they told us that they wanted to hire every single person they met in our community." He says that Rexburg "focuses on working with businesses that are interested in coming here to help them find the space they need. We work with developers to get new space built." Merrill says that "we want to be known as the place where families can feel safe and raise their kids in a good educational environment. We invite you to look to Rexburg as the opportunity you need to start and grow your business." This Investment Profile was prepared under the auspices of the City of Rexburg. For more information, please contact Rexburg's Department of Economic Development, 208-359-3020 or by email at economicdevelopment@rexburg.org. From its striking natural beauty to its sparkling business environment, the Gem State's unique facets lead to growth and opportunity.